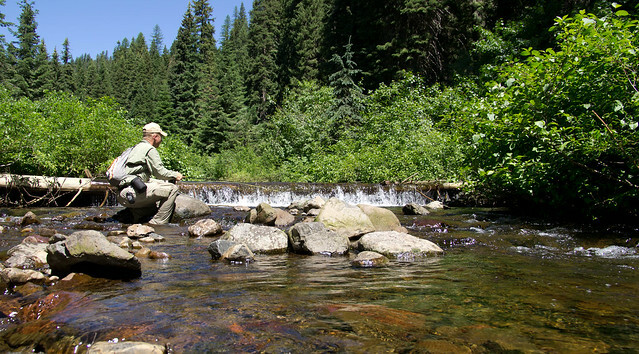 The North Fork of the Wenaha river has eluded and surprised me many times. My first attempt at just getting there was thwarted by snow when I nearly slid my pickup off the mountain side. I tried to crawl the pickup over a snowbank and I slid to the edge of the narrow mountain road with a precipitous drop off inches away. That trip it took Jeff and I most of a day to dig out a path for the pickup and we never even made it to the trailhead. My second failure was again with Jeff and we made it to the trailhead but ended up on the wrong trail. I finally made it in to the North Fork two years ago and was blown away with how beautiful the section of creek was downstream of the Indian Tom trail. 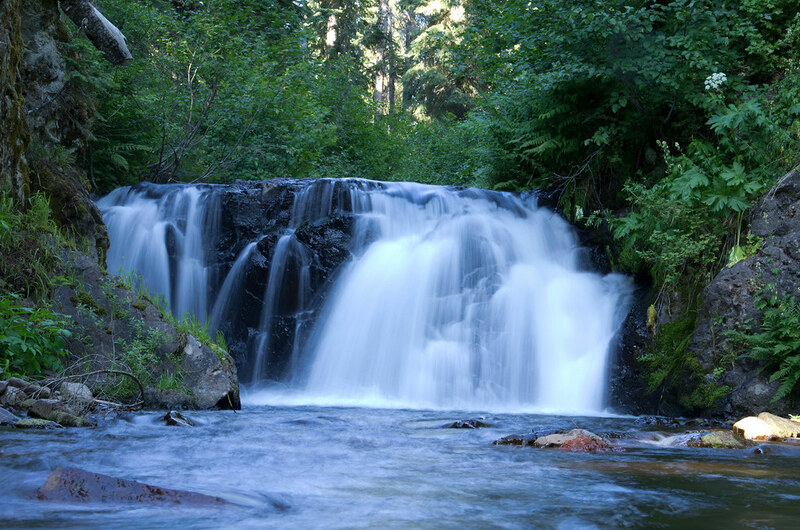 Water seemed to cascade down around each turn as new springs fed and grew the North Fork. Last year I made a return trip to the North Fork via the Indian Tom trail in hopes of finding a main waterfall on the North Fork of the Wenaha and then hiking downstream to the forks and out the Elk Flats trail. Not knowing where the falls was I failed to hike far enough upstream but none the less had a great time hiking down the North Fork and seeing a new section of the Wenaha for the first time. Each failure has deepened my knowledge of the river and the mountains surrounding it and I have come back better prepared each time. After my last trip I was lucky enough to have Jason Shappart send me a 1950’s Forest Service survey in which they had spotted the falls by plane and placed its approximate location on a hand drawn map. According to the hand drawn map, the falls should be just west of Buck Ridge. My Wenaha-Tucannon Wilderness area map also shows an old unmaintained trail going part way down Buck Ridge. Hiking down Buck Ridge would put me much closer to my intended target, the North Fork Wenaha Falls. After my cougar encounter the weekend before on Joseph Creek I decided to bring my border collie Molly along. I thought I would sleep much better if I could rely on her much better ears and much better nose to smell things like stalking cougars. So Molly and I headed out late Saturday morning. Life has been hectic and hiking into the North Fork was a last minute plan that didn’t materialize until the night before. It was OK though. I don’t feel like I need to spend so many hours on the water as I have in the past. This trip was less about fishing and more about finding the waterfall anyway. We headed out to Dayton and then turned up the Touchet River towards Bluewood. After going past Bluewood we took a left onto forest service road 46. I wasn’t sure how the road would be, but it was quite good and would be easily travelled by a car. I had turned my Delorme PN-60 GPS on (which we have for sale at the Minam Store by the way). I wasn’t sure if there was going to be a parking area, but I came to a wide spot in the road where a trail clearly disappeared through the trees. According to my GPS this was my starting point. I pulled my rig off to the side and Molly and I got ready to go. Buck Ridge is quite flat for a distance, following the natural slope up and down. It was typical Wenaha scenery. 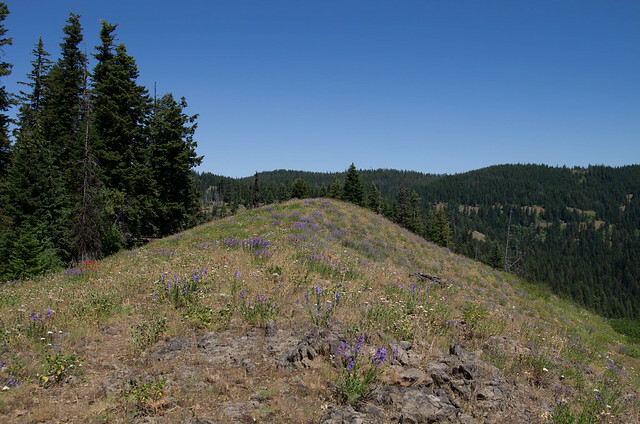 The ridge we were on was scattered with trees, brush, and flowers. There were many open sections of ridge that were composed more of rock than anything resembling soil. Straight out ahead lay the North Fork of the Wenaha in the bottom. To our right was densely wooded slopes with Squaw Peak as the highest point, still holding what looked like from a distance a fair amount of snow. To our left the slopes must have worse soil as there was a lot more exposed brown through the trees. The start of the trail was well worn, but grew less worn as we went. There were few trees in the way for the most part, although the trail could handle being cleaned. Like most unmaintained trails, I got off on game trails here and there that liked to disappear into nothing. Finding the main trail again after losing it was not too difficult though. As the ridge gets closer to the North Fork it also begins to lose more elevation and began to grow faint. All in all, it wasn’t too bad. Much easier than the Indian Tom trail and only 1,600 feet elevation to lose rather than 2,100 feet. I knew I would appreciate not having to climb another 500 feet on the way out. Once on the bottom I scouted around until I found a semi-flat spot for my camp. I again only packed my rainfly off my Hennesey Hammock tent for cover. I started heading upstream as quickly as I could because I wanted to find the waterfall on the North Fork of the Wenaha that day. I strung up my rod and sampled the fishing often though and I had a good time catching smaller rainbows on an orange stimulator with an occasional small bull trout rising to the fly as well. The North Fork of the Wenaha is quite small up this high and the further I went the smaller it got. Along the water the vegetation is super thick and there is no bank to walk on unless you want to fight the bushes. There were even a few spots where the brush was completely covering the North Fork and I had to push my way through it midstream. So Molly and I waded upstream, quickening our pace the later into the afternoon it got. By the time I came to the waterfall it was getting closer to evening than later afternoon. It was worth the hike to me though. I was not disappointed with the falls, although it is probably not 20 feet tall unless you count the plunge pool below it. It was pretty though and I seriously doubt many fish make it upstream of this waterfall. The first time I had read about the waterfall on the North Fork was in a paper about bull trout. In the paper they mentioned the fish above the falls looking physically different from the fish below the falls. After getting a few pictures of the waterfall I hiked up around it and went upstream a little ways to see. 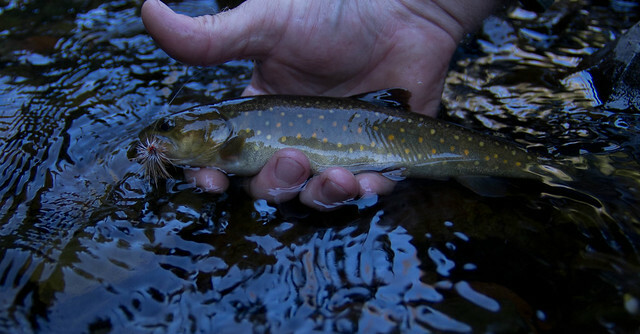 I cast in a few likely looking riffles and caught a small bulltrout on the stimulator again. I almost never catch bulltrout this small on the main Wenaha so I did not feel like I could objectively say whether this small bull trout above the falls looked much different than fish below. After letting the small bull go it was time to make tracks the several miles downstream to camp before dark. I can fly along pretty good on slippery rocks, I have had lots of practice. Pretty soon my dog Molly was lagging behind a little though and at first I felt rather proud of myself for being able to out pace her for once. She began to fall further behind and I stopped to let her catch up. She was shivering badly. I never thought about it before, but she was often nearly submerged in the cold North Fork. I worried that if I made her stay in the water all the way back to camp it could lower her core body temperature pretty seriously so I decided to climb the bank and find a game trail so she could warm up. I began on the west side of the creek and got up far enough from the water that the going wasn’t too bad. Besides an occasional stand of extremely thick brush, I was primarily hopping over downed trees. I came to a cliff face and was forced back down to the water for a while. I followed the water for a short distance and then took Molly up the east bank to find a game trail again and let her warm up. I hadn’t brought my waders and was wet wading. I did not get out my thermometer to measure the water temperature, but my feet hurt from the cold after being in it for a little while. Going down the east bank I eventually found a trail. It surprised me a little because none of my maps show a trail here. The trail had plenty of downed trees over it, but it was a good trail that has seen a lot of use at some points in the past. Molly and I were able to follow it all the way down to our camp, although near our camp and the bottom of Buck Ridge the trail was not distinguishable at all because of the lush vegetation that was often eyeball high or more. Sunday Molly and I explored downstream. I was in no hurry. I felt no need to cover miles of water as I usually do. Molly does much better when I take my time and stop and fish. This allows here to get out of the water on the sides and she never had a problem getting too cold on Sunday. After wading and fishing downstream for a ways I got curious about that trail we had found the night before and I began getting off the creek and trying to find remnants of a trail. 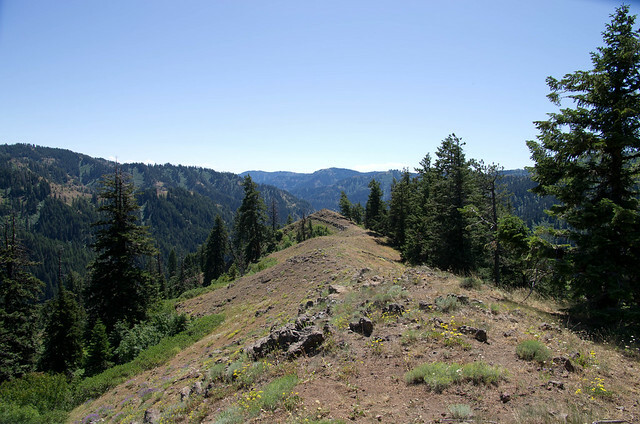 I not only found remnants, I found a well used and maintained trail downstream of Buck Ridge. It went downstream for some distance and we followed it until it ended at a campsite. We then followed the trail back upstream and just before getting to the bottom of Buck Ridge the trail began following a small creek that runs down the canyon to the east of Buck Ridge. I walked up the trail for a good 30 minutes and it had been used and cleaned this year. I finally decided I had better turn around as my pack and everything was still at camp. But there is a decent trail going into the North Fork of the Wenaha. The trick is going to be finding where it starts at the top. Molly and I made our way back to camp and I packed up my stuff. We made a leisurely hike out. Buck Ridge is a little steep in spots, but it really isn’t too bad if you are used to this kind of stuff. I also packed super light, not taking a tent or waders which makes the hike out even easier. If the North Fork were any deeper I would have my waders because it is cold enough that it made my feet and legs hurt after a short time. I can check one more thing off my list now: I have seen the waterfall on the North Fork of the Wenaha and saw a bull trout that may be a genetically distinct strain from the fish below. This entry was posted in Wenaha. Bookmark the permalink. That trail you found is what my family calls “The 20 mile”. My greatgrandfather Elmer Elkins lived in Dayton with houses on the north and south Touchet roads. He horse camped aprox 5 miles down at Big Thunder camp and Second camp shortly over the border, (Indian trail meets the North fork in between these camps) and trailed down to Elk flats outside Troy oregon, several times a year in his younger years. Our family (and an elk outfitter for the first 3-4 miles) have used that trail ever sense. My grandmother Violet Elkins-Unverzagt took me from when i was 6-7 until I had to quit to maintain my own family. But I have never seen the falls you pictured. I think maybe they are upstream from where our trail meets the creek. or are on a section that is missed by our horse trail. I havent been in almost 20 years but I could find that trail in my sleep.